Visitation will begin at 9 AM at the church. Entombment following mass at Resurrection Cemetery. Food and fellowship will follow at Marriott West Convention Center, 1313 John Q Hammons Drive; Middleton, WI 53562 from 2 PM until 5 PM. Following the mass, a reception will be held in the Rectory Hall of St. Augustine Cathedral. For those who wish to assist in building a final resting place for Bishop Morlino (and other bishops of the Diocese of Madison) please visit diocesemadisonfoundation.org or contact the Catholic Diocese of Madison Foundation for more information on the Bishop Robert Morlino Memorial Fund. The Most Reverend Robert Charles Morlino, age 71, Bishop of the Diocese of Madison, passed away on Saturday, November 24, 2018 at 9:15 pm in SSM St. Mary’s Hospital, Madison, Wisconsin. He was born in Scranton, Pennsylvania, on December 31, 1946, to Charles and Albertina Morlino. He was raised in Lackawanna County, Pennsylvania, where he graduated from the Jesuit-run Scranton Preparatory High School. He entered the seminary for the Maryland Province of the Society of Jesus and was ordained to the priesthood for that Province on June 1, 1974. Father Morlino continued his studies at Fordham University, New York City, New York, where he earned a bachelor’s degree in Philosophy; the University of Notre Dame, Notre Dame, Indiana, where he earned a Master’s Degree in Philosophy; Weston School of Theology, Cambridge, Massachusetts, where he earned a Masters of Divinity, and the Pontifical Gregorian University, Rome, Italy, where he earned a Doctorate in Moral Theology with specialization in Fundamental Moral Theology and Bioethics. Father Morlino became a priest of the Diocese of Kalamazoo in 1981 where he served as Vicar for Spiritual Development; Executive Assistant and Theological Consultant to the Bishop; Moderator of the Curia, and as a Promoter of Justice in the Diocesan Tribunal. He served as administrator of numerous parishes and rector of St. Augustine Cathedral. He taught Philosophy at Loyola College in Baltimore, Maryland; St. Joseph University in Philadelphia, Pennsylvania; Boston College, Massachusetts, and the University of Notre Dame and St. Mary’s College, Indiana. He served as an instructor in Continuing Education for Priests, Religious, and Laity and as Director of Parish Renewal Programs. Father Morlino was scheduled to begin a full-time faculty appointment as Professor of Theology at Sacred Heart Major Seminary in Detroit, Michigan, when Pope Saint John Paul II appointed him the Ninth Bishop of Helena on July 6, 1999. 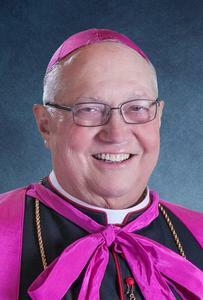 Four years later, Bishop Morlino was named the fourth Bishop of Madison on May 23, 2003. He was installed on August 1, 2003. During his 44 plus years of ministry to the Catholic Church Universal, on the national level Bishop Morlino served as chairman of the United States Conference of Catholic Bishops (USCCB) Committee on the Diaconate and the Ad Hoc Committee on Health Care Issues and the Church. He also served on the USCCB Bishops’ and Presidents’ Committee, which seeks to encourage the Catholic identity of institutions of higher education. Bishop Morlino served as Chairman of the Board of Directors of The National Catholic Bioethics Center (NCBC) which conducts research, consultation, publishing, and education to promote human dignity in health care and the life sciences. He also served as Chairman of the Board of Visitors for the Western Hemisphere Institute for Security Cooperation (WHINSEC). This board was a federal advisory committee created by the United States Congress to maintain independent review, observation and recommendation regarding operations of the institute. In 2006, the national Alliance for Marriage joined with the Congress of Racial Equality to present Bishop Morlino with their Lifetime Achievement Award for his promotion of the fundamental rights of Freedom of Speech and Freedom of Religion. In 2008, for his work in defense of the dignity of the human person, Bishop Morlino was awarded Human Life International’s Cardinal von Galen Award, named after the famous German bishop who worked actively against the Nazis. That same year, he also received the St. Edmund’s Medal of Honor, awarded to Catholics who have used their God-given talents in promoting the common good. For his service to the United States of America and his promotion of human rights education, the bishop was honored by the Department of the Army in 2009. In 2015, he was the recipient of the Relevant Radio Christ Brings Hope Award and earlier this year, he received the St. Thomas Aquinas College Medallion. the number and quality of the men ordained to the diocesan priesthood; to instill a greater sense of reverence throughout the entire diocese, especially through our worship of God, celebrated in the Holy Sacrifice of the Mass, and to challenge Catholic institutions in the diocese to live out their professed faith in Jesus Christ, risen from the dead, through their ministry in the secular community. He succeeded in accomplishing what he set out to do in the diocese by way of fostering greater priestly vocations (he ordained 40 men to the priesthood, with another 24 presently in formation), bringing a greater sense of reverent worship to the entire diocese, and by making significant inroads toward encouraging the Catholic institutions in his care to live out their mission with greater fidelity. He was preceded in death by his parents, Charles and Albertina Morlino. The Most Reverend Robert C. Morlino passed away on Saturday, November 24, 2018. The Mass of Christian Burial will be celebrated at St. Maria Goretti Catholic Church, 5313 Flad Ave., Madison, Wisconsin on Tuesday, December 4, 2018 at 11:00 am. The Most Reverend Jerome Listecki, Archbishop of Milwaukee, will be the principal celebrant with The Reverend Monsignor James R. Bartylla, Diocesan Administrator, as homilist. A Prayer Vigil, with opportunity for visitation, will be held Monday, December 3rd, in the Bishop O’Donnell Chapel at Holy Name Heights, 702 S. High Point Rd., Madison, from 1:00 pm until 7:00 pm, with Solemn Vespers beginning at 7:00 pm lead by The Most Reverend Paul J. Swain, Bishop of Sioux Falls. Visitation will also be on Tuesday morning from 9:00 am until the start of the Holy Mass. Interment will be in Resurrection Catholic Cemetery, 2705 Regent St., Madison, immediately following Mass. If you have intentions to attend the funeral, please visit the diocesan website, www.madisondiocese.org to express that intention to the Diocese of Madison. Seating will be limited and the bishop’s funeral will be streamed live, with some designated viewing sites available in Madison. In lieu of flowers, those planning an expression of sympathy may wish to consider memorial contributions to the Bishop Robert Morlino Memorial Fund. This fund is intended to support the Cathedral Building Fund of the Diocese of Madison, specifically for the erection of a small chapel and crypt in memory of Bishop Robert C. Morlino within the future Diocese of Madison Cathedral building. The crypt would be intended to represent the architectural design envisioned by the late Bishop Robert C. Morlino suitable for a cathedral building and house his tomb and any past or future Bishops of the Diocese of Madison and possibly other clergy.